Jay Haysey owns the successful GlobalShots media company which specialises in shooting watersports – specifically windsurfing and SUP. He got into stand up to make the most of lighter wind mornings in Vassiliki, Greece. Soon he was smashing out the miles and together with fellow paddler, Adam Chubbock, completed the first circumnavigation of the Greek island last year. Currently based out in the French Alps, we caught up with Jay to see how his winter SUP training has been going. You’ve done multiple seasons out in Vassiliki (Greece) which is known more as a windsurfing playground. How did you get into SUP? SUP has been in Vassiliki for a while now. It’s a great thing to do during light wind mornings and the odd afternoon when the wind doesn’t show. 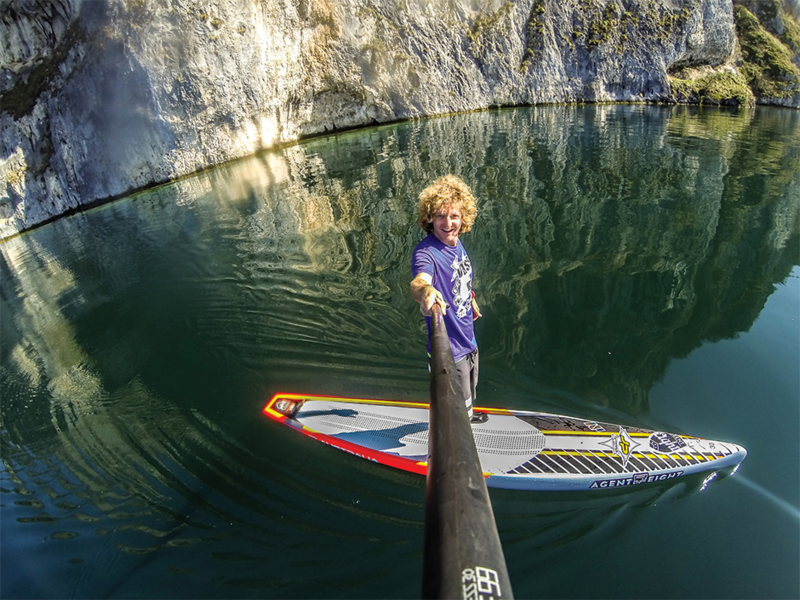 How was paddling round Lefkada with Adam Chubbock? We had an awesome time! The idea came the night before. I had just got back from the SUP 11 Cities event. It was pretty cool to see the island from another angle after spending so many summers there – looking forward to doing it again. Distance and endurance seems to be your thing (from FB updates anyway), do you SUP surf or is it just about chewing up the miles? I enjoy all aspects of SUP. I think that’s important – surf, flat water, racing and touring are all great fun. You’re currently out in mountains but still seem to be getting a load of flat water sessions under your belt – tell us a bit about where you’re paddling? I wanted to keep up my fitness during winter but knew it was going to be hard in the French Alps. Luckily for me I’m only 30 minutes drive from Lake Annecy. It took a while to get used to gloves, boots, hat and wetsuit but every now and then we do get a bright, sunny and glassy day. I’m using a JP race board (12.6ft). Even though I haven’t done any specific race training it’s great to get out. Do the locals think you’re a bit mad paddling during winter? I’ve definitely had some funny looks. People seem to enjoy taking pictures when I go past. SUP isn’t big here yet – I guess it’s not something the French do in winter! Are you paddling/training with anyone else? Solo, but looking forward to paddling again with friends in Greece. Do you have any plans for other long distance routes in 2014? Will definitely do Lefkada again, but head the opposite way, and hopefully tick off some other Greek islands during the summer. I’ve been very lucky to get support from JP International and NP surf, through the guys at Agent Eight. I’m kitted out with a couple of flat water race boards, NP paddles and accessories. I’m very grateful for their help. How did their support come about? My friend Andy Chambers works at Agent Eight. They were looking for a rider to join the team and I guess he liked what I did last year so the partnership was born. I’m thinking of doing the SUP 11 Cities again but maybe this time the non stop category. It will definitely be the biggest challenge I’ve ever taken on. I’ll no doubt go through some new pain barriers – both physically and mentally. What’s on your agenda after the winter? I head back to Vass in April. GlobalShots will continue photography and film making, as well as organising another SUP event during August – we’ll be looking to improve on last years. Give a brief rundown of the other sports you do and how they help with SUP. I windsurf, kitesurf, ski, snowboard and MTB – it’s good to mix things up. The GlobalShots team, the Club Vass team and the Agent Eight team – all a great bunch of people.